A professional DVD Decryptor, DVD Ripper, DVD Backup, DVD Editor for enjoying DVD movie in anyway with ease and satisfaction. Do you want to play DVD movies on your Motorola Atrix 4G? There is no DVD-Rom or port for connecting, and the DVD videos with MPEG-2 codec do not play on Atrix 4G. Aunsoft DVD Ripper comes as a fascinate solution to rip DVD movies to Atrix 4G by removing the copy protections on commercial DVD, and you can even hard burn subtitles on the Atrix 4G videos. Follow the steps below, and you can put and play your DVD movies on Motorola Atrix 4G. The following steps are for Windows computer. If you are using iMac or MacBook Pro with Leopard, Snow Leopard, you may use the best Motorola Atrix 4G DVD Ripper/converter. Insert the DVD disc to DVD-Rom as the source file. Click the " DVD Rom" button to load the entire DVD disc. If you have DVD movies with DVD-Video file structure on your hard drive, you can click the " DVD Folder" button to load the DVD movie from hard drive. Step 2. Choose Atrix 4G MP4 output. Select output format for your Motorola Atrix 4G. Here click the "Format" option, and choose Android > Motorola Droid (X) H.264 Video(*.mp4) as output format. Even though it is the profile for Droid X, it also works for Motorola Atrix 4G. Or you can select HD Video > H.264 HD Video (*.mp4) for Motorola Atrix 4G and keep 1080p resolution. Step 3. Compress DVD to Motorola Atrix 4G. Click the convert button below the preview window, start ripping/converting DVD to Atrix 4G MP4 will start immediately. Wait for a while until the conversion is finished. 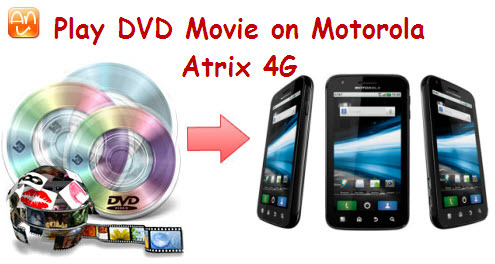 Connect your Atrix 4G to computer, transfer and mount the converted DVD movies to Atrix 4G phone. 1. If you want to watch DVD movies with subtitles on Atrix 4G, you can choose the main movie and click the "Subtitle" option for conversion. The DVD to Atrix 4G converter even supports ripping movies with forced subtitles. 2. Besides converting DVD movies to Atrix 4G, the converter also supports importing Blu-ray disc (BD) and Blu-ray movies. To load several discs or movies for conversion, you can try Blu-ray Video Converter Ultimate as your exclusive Atrix 4G video converter Ultimate. For the first I will thank you for an excellent product which exceeds all my expectations. I´m so pleased with it and use it daily until every DVD movie I own has been transfered to my computer. I started with your trial version and find out immediately that this is the software I need for copying movies, of course for my own purposes, and bought your software.